FAME. Some familial epilepsy syndromes are notoriously resistant to gene discovery. Familial Adult Myoclonus Epilepsy (FAME), a rare but distinct familial epilepsy, has been one of the familial epilepsy syndromes that has been around for more than a decade. Despite the power of modern massive parallel sequencing technologies, this syndrome has been hard to tackle. In a recent publication, we take a small step in narrowing down the region for the FAME gene. Let’s use this opportunity for a reality check of the somewhat disappointing state of gene discovery in familial epilepsies in 2016 and what we can do about this. Figure. 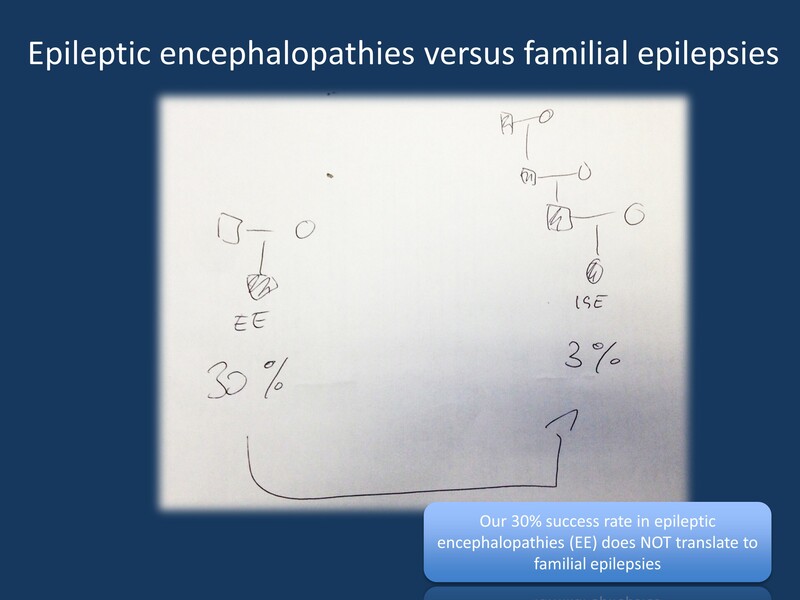 The 30% success rate in gene discovery in epileptic encephalopathies does not translate to familial epilepsies, particularly not to the genetic/idiopathic generalized epilepsies. Even though it is counterintuitive, we have a much higher chance for gene discovery in a single patient with epileptic encephalopathy (EE) than in a four generation family with genetic/idiopathic generalized epilepsy. FAME – epilepsy or movement disorder? Familial Adult Myoclonic Epilepsy (FAME) is an enigmatic familial epilepsy syndrome with the triad of myoclonus, tremor and seizures. Several families have been described and two loci on 8q23.3-8q24.11 and 2p11.1-q212.2 for FAME have been established. The underlying genes are still unknown. The familial disease usually starts with tremor in early adulthood in the affected family members, even though a wide range of age of onset is observed. One may argue that in some families FAME may actually be better characterized as a movement disorder with concomitant seizures rather than a familial epilepsy syndrome. In a publication that we reviewed in a blog post in 2012, the authors pointed out the difficulties distinguishing FAME from the much more common essential tremor (ET). In particular, the well-described response to β-blockers seen in patients with ET can also be observed in some family members. Familial epilepsy. The image for this blog post is somewhat low quality on purpose as this is a real-life example. The current figure is taken from a quick illustration that I pinned up in our CHOP Neurology resident room in order to illustrate our current dilemma for familial epilepsies in 2016. While we have made remarkable progress in deciphering the genetic basis of epileptic encephalopathies, we’re somewhat stuck when it comes to familial epilepsies. Even though it seems counterintuitive, we have a very low chance of finding a causative gene in a medium sized family with genetic/idiopathic generalized epilepsy. Ask yourself, how many genes for familial GGE/IGE do we actually know – my list usually stops after GABRG2, GABRA1, and SCL2A1. Even though many of these families are out there, the genetic basis remains to be discovered. Such a family is too small for linkage analysis and even when we have exome/genome data on each individual, there would be too many variants to choose from. We simply won’t be able to rise above the genomic noise. But what can be done to overcome this problem? Solutions. Basically, to solve the dilemma of unsolved familial epilepsies, I would suggest three strategies. 1 – Brute force. Let’s go for genomic brute force. Let’s sequence a large number of families and devise a statistical analysis method that will help us match genes that we find in more than one family. We won’t find the gene if we only look at a single family, but maybe a particular gene stands out in more than one family if we look at a large number of families. Be aware that I am suggesting this in non-statistical terms on purpose. Arriving at a genome-wide significance with such a method will be a challenge in itself. 2 – Meaningful sharing. Let’s find a meaningful way to share data on sequenced families. Many research and clinical groups have sequenced a large number of familial epilepsies. In fact, it would be difficult to imagine that a four generation family as described above would remain unsequenced in 2016. However, as the results are usually negative, the data is usually siloed within a research group. While we have become good at sharing data for novel gene discoveries in epileptic encephalopathies within our consortia, doing the same in familial epilepsies is more involved. Currently, we have plans to make the full exome data from our Israel-Palestinian Epilepsy Family Project (“Trilateral Project“) available to the community once we have completed our sequencing part. We hope that resources like this may help find gene after gene over the long run. 3 – Phenotyping. This point brings us back to the FAME story. Familial Adult Myoclonus Epilepsy is interesting as it represents a distinct phenotype that can easily be missed. For example, a large FAME family that our consortium is working on was initially not identified as such, but was felt to have a separate, novel phenotype. Especially for rare phenotypes, clinical information can be the key to grouping families in a meaningful way. For example, if FAME was simply included in linkage studies of familial epilepsies, the two FAME loci would not be significant. When highlighting the particular aspects of FAME, the linkage signal appears again. And this is the power of phenotype studies even if the gene still remains elusive. FAME linkage. To summarize, in the current manuscript by Lenden and collaborators, we refine a linkage interval of the FAME2 locus on chromosome 2. Basically, by using high density markers for common polymorphisms in the human genome combined with an identity-by-decent analysis, we were able to cut down a few megabases of the previously known linkage interval on either side. FAME remains an enigmatic familial epilepsy syndrome representing the borderline of epilepsy and movement disorder. Further detailed phenotype studies and subsequent linkage analysis will help us further narrow down a candidate region for this familial condition and hopefully help identify the underlying genetic etiology. This entry was posted in 2016, Familial epilepsies and tagged FAME, familial epilepsies. Bookmark the permalink.